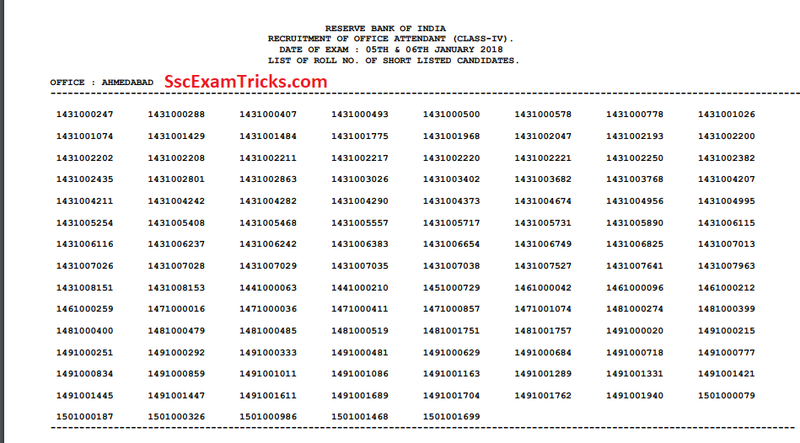 RBI Office Assistant/ Attendant Result 2017 Merit List Cut off Marks Selection List - RBI Office Assistant Admit Card 2017 Call Letter Download - RBI OA Recruitment 2017- Reserve Bank of India Office Assistant Notification 2017 Apply Application Form Online - www.rbi.org.in. Latest News (09.02.2018) - Recently, RBI has uploaded the result of Office Attendant of examination held on 05th & 06th January 2018. The roll number wise list of candidates shortlisted for LPT (Language Test) has been uploaded. In case any candidates don't find their name in this list, this may be understood that he/she has not qualified/ cleared the examination. i. All candidates are required to bring 6 copies of Attestation Form (all in original) and 2 copies of Bio-data form and these documents must be filled in neatly by the candidates. ii. OBC candidates - In addition to (i) above, OBC Declaration in original and a copy of latest OBC Caste certificate in the prescribed format. iii. 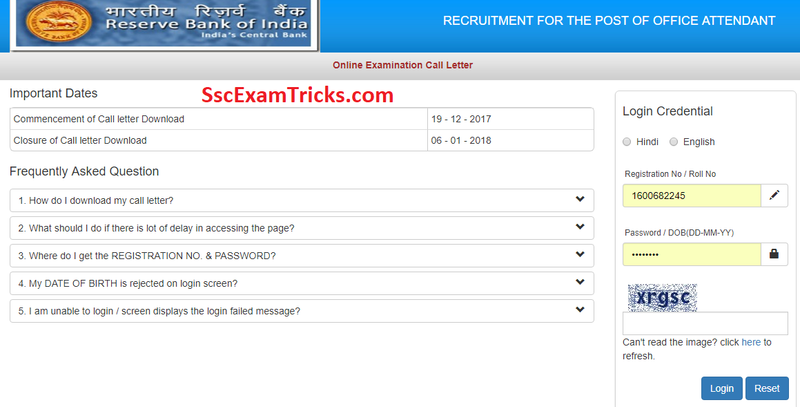 SC/ST candidates - In addition to (i) above, latest SC/ST Caste Certificate in the prescribed format. v. Ex-Servicemen - In addition to (i) above, appropriate NOC/release certificate as provided Annex II to the advertisement. The good news is that RBI Attendant Admit Card has been uploaded now. The exam date is 06.01.2018. These online admit card can be downloaded by using registration number and password/ DOB of the candidates. These call letter will last up to 06.01.2018. The Latest News is that Reserve Bank of India (RBI) has released Final result and list of Finally selected candidates for 526 posts of Assistants for various department of RBI on the official website which is mention in the end of the post. These shortlisted candidates will be called to collect appointment letter with their recruitment station which will be released after announcement of Final list of selected candidate or Final Result on official website. Those candidates who had appeared in the exam and waiting for the result can download their Final result from the direct link provided in the end of the post. The list of Finally Selected Shortlisted can get their Appointment letter from this direct link whenever it gets released on the official website. The final selection process will be based on Written Test (CBT). The online test will be held in the month of December 2017/January 2018. Educational Qualification - 10th Pass. Selection Process- Based on Written Test (CBT). The RBI Assistants Exam was conducted on December 2017/ January 2018. The RBI Assistant EXAM 2017 will be conducted by ONLINE MODE. The exam was conducted an objective multiple choice question paper of 120 questions of 200 marks to be done within 2 hours or 120 minutes. The exam was consisted of four sections contains questions of English (50 questions of 50 Marks), Engineering Subject Questions (50 Questions of 100 Marks) and General Awareness (50 questions of 50 marks). 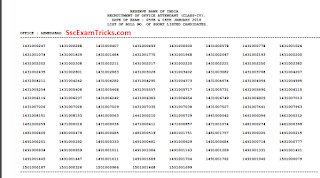 The exam was a multiple choice question paper in which five options were provided out of which candidates need to choose one correct answer. There was 1/4th negative marking for each wrong answer. For more information candidate must download syllabus and exam pattern of RBI JE EXAM from the official website. · NOC (No Objection Certificate) in case of working somewhere. Click here to download the complete Advertisement for the posts of Assistants in RBI. Latest News: RBI Assistant Scorecard 2015 has been available now (15th December 2015) on official website www.rbi.org.in in which marks obtained in written test (August 2015) and interview (September 2015) has been displayed with minimum cut off marks required to get selected for appointment on Assistant posts in various banks. Those candidates who wants to check their performance in both written and interview test can click on direct link to download their scorecard of Assistant Recruitment 2015. The latest news is that RBI Assistant interview result has been announced on 03rd December 2015 on www.RBI.org.in. The candidates can check their result and merit list from direct link given here.